What kitchen, bar or restaurant doesn't need a quality stainless steel bottle opener This stainless steel bottle opener is 7 inches long for added leverage and comfortable opening. 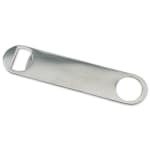 This stainless steel bottle opener is extra thick so there is no risk of snapping or bending and because it is constructed of 18/8 stainless steel it will not corrode or stain. Because of it's thick design, opening soda, beer, and tonic bottles will be nearly effortless! At such an incredible value any venue can afford to have several of these stainless steel bottle openers on hand! "A thin flat bottle opener is around 1/16" thick. That's what this is. You couldn't go any thinner than that. So by saying these are 'extra thick'..."
"Very simple design. My favorite over the fancier ones in the house." "A thin flat bottle opener is around 1/16" thick. That's what this is. You couldn't go any thinner than that. So by saying these are 'extra thick' implies they're thicker than normal. Thicker ones have better stamping and zero chance of bending. Those are about 1/8" thick and hard to find. I'd advise whoever lists this item to add thickness along with length and width. They do work still :)"